For more information on the main altar, communion railing, windows, confessionals, and organ see the menu to the right. The 12 round stained glass windows in the clerestory were made by the W.H. Carse Co. of Chicago in 1860 and are the oldest stained glass in the city. The nave of the church was extended 40 feet to the south in 1866, and a new facade was built to buttress the south end of the building. The main altar, 52 feet of elaborate wood carving, with 13 sculpted wooden statues, was dedicated in 1865 and is the work of Anthony Boucher, an immigrant from Germany. Mary&apos;s altar and St. Joseph&apos;s altar and their statues, as well as the confessionals in the church, were carved by Sebastian Boucher, Anthony&apos;s nephew, and were dedicated in 1873. The intricately carved walnut communion rail (1866) is the work of Louis Wisner, a Lutheran neighbor whom Fr. Damen engaged for this work. The seven lights which Fr. 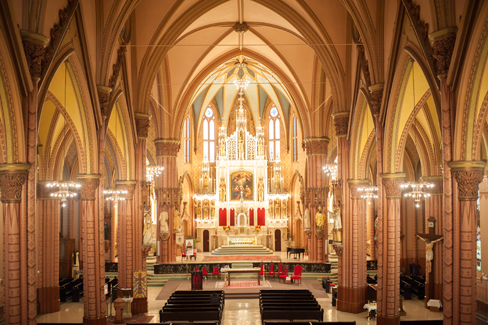 Damen vowed would remain lit forever if the church were spared from the Chicago Fire in 1871, can be seen at the shrine of Our Lady of Perpetual Help in the east transept of the church. The great tower of Holy Family Church was designed by Paul Huber and was erected in 1874. It rises to a height of 236 feet and was the tallest structure in Chicago from 1874 until the Monadnock Building was erected in 1890. The two bronze bells in the tower were cast by the J. Stuckstede Co. of St. Louis in 1863. The bells were automated, and the tower illuminated for the first time in December 1991. The electric lights were installed on the altars and around the church in 1899. The Adoration of the Magi window, the Annunciation window, and the stained glass windows commemorating the Jesuit saints around the nave were all made by the Von Gerichten Art Glass Co. of Columbus, Ohio, and were installed in 1907, the golden jubilee of the parish. In 1870, the great Mitchell Organ and the "orchestra" of wooden angels - hand carved by French-Canadian sculptor Charles Oliver Dauphin - were installed in the church.